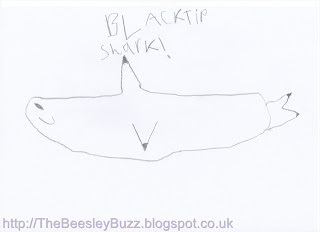 Well, Daddy has been despatched to write this blog post this week to join in mummy from the heart's linky. So, here goes....! Totally unexpectedly, I got to see Dame Kelly Holmes today.... now that doesn't happen everyday, does it? 2. He's an Actor, darling! Today D had his weekly drama lesson, and found out his part for the show at the end of term. He has grown in confidence so much since joining the group, and loves his weekly slot of excitement, fun and acting. Rather than just 'fitting in', he has really started to shine in his own right. And his excellent performance last term (more about that here, too) has stood him in good stead as he takes on the the lead role in eight weeks! So proud of you, D! A short while ago, Becky was invited to write a guest post for New Bloggers Fortnight. She was so nervous about putting it together, and a little anxious as it went live this week. But everyone has been so supportive and encouraging. Thank you! She just needs to get the hang of Twitter now to be able to reply and thank everyone for their kind words! Short and sweet this week, but definitely a cheerful household today! What are your reasons to be cheerful? I have been meaning to write this blog post for a few days now since seeing a post on Mummy from the Heart's blog about the #IF campaign. This was not like the zillion other topics that pop into my mind to do a blog post on and then I never quite get around to it. This was one of those that I HAD to do. In a nutshell, #IF is about raising awareness that there is enough food in the world for everyone, based on four IFs. With the G8 summit being held in the UK this year, we can all do our part to put pressure on governments and world leaders to make those IF's happen. All I am asking you to do, is visit the IF page and add your voice - I've just added mine and it took about 2 seconds. It is not often that I plead with you to do anything. I generally don't ask for likes, shares, comments or anything like that on my blog posts - but this one thing I plead you to do right now and then pop back here and read the rest to find out why. Have you done that? Thanks. If not, please pop over and do it now. I'm not going to go into detail about the four IF's as you can read everything on the webpage and the pages of other organisations that are supporting it for example, ONE and Save the Children. I know I am probably supposed to list various bits of information and give certain details but in my usual 'totally useless with anything technological' style I didn't manage to successfully download the bloggers media kit with the info about writing a blog post on this, so you will just have to put up with me doing it my own way. For anyone that doesn't know, I am totally and utterly useless with anything to do with maths or statistics. I just have to see a number and I panic! So whenever I used to hear any facts about the number of people living in poverty around the world, or dying from aids, or suffering with malnutrition, my brain just kind of switched off to the numbers. These numbers are often so high that it is just hard to comprehend what that many people is like. Coupled with the feeling of helplessness of not feeling able to do enough to make any significant difference, it just often ends up being easier to switch off and try not to 'absorb' any of it. Well I decided I wanted to know what this number looked like. I didn't want to ignore it, I wanted to understand it. My belief is that once people actually realise just what is going on out there, they will want to do something about it. I just think that for many people, the numbers just seem overwhelming and often meaningless when they are not given a context to understand it. So I found out that in the town where I live, there is a population of 30,000. So the number of children that were dying each day was the same as the number of people living in my town. So the scale of death that was happening around the world in JUST ONE DAY would be like me waking up to find everyone in the town where I live gone. When I thought of it like that it just shocked me to the core. Would we here in the UK accept that scale of tragedy if it was happening here in the same way that we accept it when it is happening to others and not affecting us directly? I think you will agree with me when I say the answer is NO. We would not accept it if it was happening to our children, our friends' children, our neighbours children. So why is it so easy for all these people dying from hunger each and every day to remain invisible to the world? Perhaps it is because they are the people who don't have a voice of their own. Why should the politicians care because they are not the people who are going to be voting for them in the next election? Why should the business leaders care because they are not the affluent market that they are targetting with their latest products? But you and I do have a voice. Whether it is in our own little corner of the internet with our blogs, whether it is with our facebook friends, or twitter followers, whether it is with other mums and dads in the playground, whether it is with our work colleagues, we do have a voice. So as well as adding your voice to the #IF campaign to make your voice heard by world leaders, remember to tell others too so they hear your voice and they can add their voice. Don't forget your own children. Make sure they understand the basics and know what's right and wrong. If we can't end it in our generation, then let's make our children grow up to be the decision makers, leaders and politicians of the future who WILL do it. Thankfully the number of children dying from hunger seems to be reducing, it is now said to be over 2 million a year. A few years ago this figure was well above 3 million. So it can be done - the situation can be improved. But 2 million? That is still too many children to lose every year from something SO preventable as hunger when there is enough food in the world...IF. 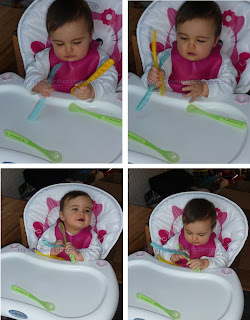 When Nuby first sent us this pack of 6 weaning spoons to try out in our role as Nuby Bloggers, I took one look at them and thought they just looked too big. When your baby is just taking those first little spoonfuls of baby rice, it just didn't seem the right spoon because the spoon end just looked too big and too curved to even fit into T's mouth. At the time she was also having just a few spoonfuls of food, so I was just making up a little baby rice or puree into a little bowl and she was never eating a whole jarful so although I could see the appeal of having long easy grip handles, it just wasn't relevant to where we were at with weaning. 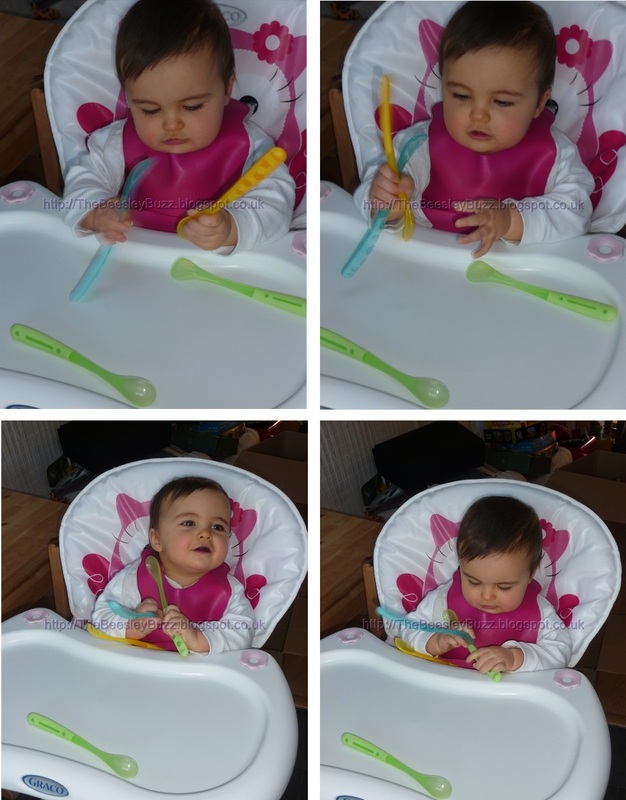 We decided to use small tipped shallow weaning spoons for those first couple of months of weaning instead. Fast forward a few months, and we now find that we are using the spoons everyday for every meal! So what's different? T is now 9 months old and weaning is very much established. She is confident in being fed with a spoon and she eats a lot more than in those early days of weaning when she was just 4 or 5 months old. She is obviously physically bigger too so the spoon size seems to be a better match. When she is having baby food straight from the jar, those long handles really come into their own and even though we previously had what we thought were long handled weaning spoons, the Nuby Feeding spoons are even longer and can reach far more comfortably to the bottom of the tall jars. Even though T is not yet 10 months old, we occasionally feed her the '10 month +' age jars. Because we have combined baby led weaning with traditional weaning, she is confident with lumpy textures and the '10 month +' jars have not proved any trouble for her. Now these jars are that little bit taller than the '7 month +' jars and impressively the Nuby Feeding Spoons have taken these bigger jars in their stride too! They come in a pack of 6 which is very handy, as T often likes to hold a spare spoon and it saves the stress of having to constantly make sure you have them washed and ready. The spoons are dishwasher safe. I couldn't find any information on the packaging about suitablity for sterilising. For us this wasn't an issue as at this stage I make sure everything is thoroughly washed and rinsed in very hot water instead of sterilising as I did in the early months of weaning. Nuby do have a customer careline for anyone wanting to check any details, though. Although the spoons are designed to be suitable from 4 months, my own feeling was that given the deep bowl in the spoon end I preferred to wait until my baby was 6 months before using them regularly. However, now those small tipped shallow spoons we used in the early days for weaning are pretty much no use for the amount T eats and her capability of eating well from a spoon and so these Nuby Feeding Spoons have really come into their own. The Nuby spoon vs our other 'long handled' feeding spoons. I just don't get it. Some days are so fine that I sometimes wonder if the doctors got it wrong. Perhaps he is not on the autistic spectrum at all. I mean - earlier in the week he had a couple of really good days. Did all his homeschool work really well, without fuss and did lots and lots of work, and then yesterday it takes until 4.30pm to do ONE small piece of work. And then today, perfect all morning, special afternoon treat to go an watch Shrek with Granny in the afternoon (during which time I miss him like crazy because I am so used to having to try to stay ten steps ahead when he is around), eats dinner, but then bedtime...MAJOR MELTDOWN. I just don't get it. I don't get the variability and I wonder if I will ever understand. These certainly are nothing compared to some of the worst experiences but they are stark reminders that our son certainly is different and any wishful thinking I have about a misdiagnosis flies straight out of the window. Like a lot of parents with children on the spectrum, there is so much that I just wouldn't want any other way. A lot of J's quirks are what make him unique and special and we love that about him. I just wish we could help him cope better with the areas of his life that overwhelm him. I guess we are just going to have to accept that to some extent it will always be a roller coaster ride with it's ups and downs, good days and bad days and we are just going to have to get better at accepting that is what a roller coaster ride does! This is definitely one of my favourite posts to write each week and it is probably one reason why I feel so cheerful on Thursdays nowadays as I look forward to thinking about my own reasons to be cheerful and seeing what everyone else has been up to. I love the fact that mummy from the heart's linky is all about finding reasons to be cheerful no matter what you are going through - so even in difficult weeks, it gives us a chance to reflect and find positives. I recently saw on a blog post about a blessings jar on 3 Children and IT (I LOVE that blog so do pop over and have a read if you haven't yet discovered it) and when I mentioned it to the kids, they were REALLY in favour of doing this idea. Basically the idea is that you just make a little note of things you are thankful for and pop it in the jar and at the end of the year you can look back and literally count your blessings. Now firstly we didn't use a jar, we used a money box. The boys won this lovely money box from Laura Lee designs in a colouring competition and although it is rather Christmas themed with the cute robin, we couldn't bear to hide it away until next Christmas so it has made a fanstastic blessings box for us to post in our little slips of paper. Secondly, the boys have enjoyed this idea so much that even though the blessings box has only been going for just over a week in our household, it was virtually full so we are going to be counting our blessings every week or so. we are not poor like over humen in the wold. we made my dinosor. I love it! What I have learnt from all this is that mummy hasn't done a very good job of counting her blessings this week, I need to add a few words to D's spelling list this week, J is rather focused on all things moshi / trashies / computers etc (so what's new!). And has a very good memory to be writing down things that happened in 2011 as his blessings. I was also interested by D's comment about the holiday and theme park as I have no knowledge of this!!! and there are also times that I would definitely question his statement that "we grew up to be nice". Loved his food mania one too (which is very true although I think he meant to say maniac). Today we ventured out to meet up with the bigger local home-ed group (i.e. not the smaller ASD group) which we last did something with nearly two years ago. There always seemed to be reasons not to go along to things because at first (with my 'making sure we did home school properly mindset') I wanted them to mainly do school work stuff rather than social stuff, then I was pregnant with T and tired all the time, then T was newborn and there wasn't time to get out and about and fit in breastfeeding sensibly into that, and all along I worry about how J would cope in a bigger group. But today I was so glad we went along. We were made to feel so welcome and the boys had a great time. I then treated the boys (and me) to mcdonalds drive thru, so it was a lovely day out. Daddy was working late again this week and so Granny was amazing at helping out with the dreaded drama run in the evening where both boys drama class times clash and one is one side of one town and the other is the other side of another town and it is actually impossible for 1 person to do the drop off and pick ups. Granny had also managed to get D to bed (and asleep!) by the time me and J got home. Daddy arrived home just a few minutes ago with left over pizza! Earlier in the day me and the boys had polished off these chocolates. In all honesty eating mcdonalds, pizza and chocolates should not be reasons to be cheerful but today they were. Goodness me what a long blog post this has become so I really must be cheerful today! What are your reasons to be cheerful? We are joining in again with Actually Mummy's Wot So funee blog hop. Mummy: "Shall I tuck you into bed now"
D: "Only if I have my favourite bear"
Mummy (looking puzzled because blue bear was already in the bed) "Whose your favourite bear?" D: "You" (he gives me a big hug), then he says "You're my best teddy bear...Love ya mamma". The other thing worthy of documenting is something J came up with a few years ago probably when he was only about 3 or 4. He invented the word 'pizzle' for when his sock had twizzled around and was feeling uncomfy. He would say, "I just need to pizzle my sock". He also came up with the word "oppositting" which quite simply means sitting opposite someone. We think that is a great word to be invented and have used it ever since. I only just spotted this linky to share your favourite family recipe with Britmums and Tilda rice as part of Tilda's initiative with the United Nations World Food Programme to donate 300,000 meals to mothers in Bangladesh. Quite simply there were two reasons why I HAD to join in - even though I have less than a couple of hours to write this blog post (sounds easy - but anything on the computer seems to take me several hours to do). 1) When 1 person in 7 battles with hunger EVERY DAY - then if there is anything that can be done to reduce the number of people going to bed hungry, then I am fully in support of raising awareness of it. As a mother, I find it unbearable to imagine my children going hungry and yet millions of mothers around the world go hungry themselves and have the added distress of seeing their children go hungry and in this day and age it just is not acceptable. The many charities and organisations doing their bit to help should be encouraged and applauded, and now we can play a part by using Tilda rice. 2) In our family, we LOVE rice. Having an Iranian mother meant that I pretty much grew up on a diet of rice. Our plates would be filled with rice at virtually every meal as kids. I have so many regrets about things I never asked my mum before we lost her unexpectedly and suddenly 10 years ago - one of those regrets is that I never learnt how to cook Iranian food. But I did pick up a few rice secrets which I am going to pass on to you now...so ssshhhh! And then I'll end this post by telling you my very favourite rice recipe. I know that there are fantastic ways of cooking rice using a rice cooker or on the hob and for really special occasions (which I will mention in a moment) it is worth doing that but to help incorporate rice into your everyday meals, here's the easiest way to cook it. Soft and fluffy Tilda basmati rice - you can't tell it was cooked in the microwave! Wash the rice in cold water (we always use basmati rice as you just can't beat basmati rice). Tip away the excess water. Place the rice in a large microwavable bowl and then pour on a drizzle of olive oil. Boil the kettle then pour enough boiling water to cover the rice by about 3cm. This bit takes a little bit of trial and error to get right but once you do your rice will be cooked to perfection every time. Pop it in the microwave for around 20 minutes. If you only have a small amount of rice to cook (e.g. 1 cupful) then you will need to cook it for less time (perhaps 16-18 minutes), if you have more rice (e.g. 3-4 cupfuls) then you will need to cook it for a bit longer (perhaps 22-24 minutes). Once your microwave beeps - it is ready! How easy is that! Now you can have rice with every meal. An Iranian rice secret - "Tahdeeg"
This is not so much a recipe in itself, but if you learn to cook this, you will be SO popular. The "Tahdeeg" is so unique and special that I don't think there is even an English word for it. It can best be described as a crispy base of rice from the bottom of the rice pan. It is not the healthiest part of the recipe as it is the part that soaks up the oil but for an occasional treat it is just one of the most amazing things you will ever taste. Now to get a crispy base to your rice, you will need to cook it a more traditional way rather than in the microwave but I cannot emphasize enough how it really is worth the effort for a special occasion treat. Measure out the required amount of basmati rice and leave it to soak in cold water for a couple of hours. This is supposed to make it easier to cook and less likely to break those delicious strands of basmati rice. Then rinse. Bring a large pan of water to the boil. Add the rice to it and bring quickly back to the boil. After a couple of minutes of this rapid boiling, the rice should be soft on the outside but firm in the middle. At this stage strain the rice and rinse it with tepid water (if you rinse out the pan you boiled the rice in with cold water and use this, it turns tepid). Ideally, you need a very fine holed colander so that the rice doesn't strain away through the holes or get compressed together in a wire mesh type sieve (But I end up using a wire mesh type as I never kept my mums rice colanders). Return the empty pan to the hob. Add in a splash of oil and a few tablespoons of water. When this gets sizzling hot, spoon in the rice gradually (so that it doesn't all tip in and get compressed in one go). Build up the rice until it looks like a mountain shape. If you want to make a bread or potato based tahdeeg then when the pan is at the sizzling hot stage place a layer of bread or thinly sliced potato at the base of the pan before spooning in the rice. Once you have your mountain of rice, use the end of a wooden spoon to poke three holes reaching down to near the bottom of the pan. This helps the steam be released into the rice. This is the bit that will sound particularly weird but it was a familiar sight in my home when I was growing up. Take a clean tea towel and wrap it tightly around the lid of the pan. Place this firmly onto the pan to prevent any steam from escaping. The tea towel will absorb excess moisture to stop it dripping into the rice and making the rice soggy. Place on the hob on a high heat. Without lifting the lid too much (you don't want the steam to leave the pan), take a peek after a few minutes to see if it is steaming. When it is steaming, reduce the heat and leave to cook for up to 30 minutes (again it depends on the amount of rice. 30 minutes is about right for about 4 cupfuls of rice which should serve about 6-8 people according to my guesstimate). During this time the tagdeeg will be forming at the bottom of the pan. Once the rice is ready, you need to prepare the sink with an inch or so of cold water. Then place the pan into the cold water. This will make the tahdeeg easier to remove. Your rice is now ready and once you have spooned out the rice from the pan you can gently remove the tahdeeg. Ideally if you have used a non-stick type pan, it should come out in one or two pieces making it look amazing too. Final instruction here is to use all your willpower to avoid nibbling all that tahdeeg before it reaches the table because it really is delicious. Saffron is an amazing spice and, with its heavenly aroma and unique flavour, it doesn't surprise me that it is considered more valuable than gold. Just a few strands of this amazing spice, ground with a pestle and mortar and mixed into a few tablespoons of hot water and a teaspoonful of melted butter is enough to colour and flavour a whole panful of rice. You really do only need the tiniest amount - literally a few strands. There was a time when it would have been really hard to get hold of the ingredients for this dish but nowadays with many ethnic foodstores around, you should be able to get hold of even the more unusual ingredients. The great thing about this dish is that served with lean chicken or fish, it makes for a healthy meal and all the colours in it really appeal to all the family. It also helps children get used to different flavours and textures. For young children you can omit the nuts and replace with peas and sweetcorn to keep all the nice colours in it. So here's my favourite rice recipe. You can either make the rice using the special occasion rice method with Tahdeeg for more special occassions or use the microwave method for an everyday meal. Cut some very very thin strips of carrot, fry lightly for a couple of minutes, add a little sugar then add a little water and leave to simmer. Peel some orange zest strips using a peeler and add to the above carrots. Soak the almonds and pistachios and then cut into thin slivers and add into the above pan. Soak some currants in water so that they absorb enough water to puff up and add to pan. Wash and fry some barberries (in a little butter), then add to the main pan. Using your ground saffron/hot water/melted butter mixture, colour patches of the rice. It will look an amazing yellow colour. Then gently layer in the pan of 'jewels' onto a serving plate (carrot, barberries, nuts etc). Be careful not to be 'mixing' or 'stirring' as this can break the rice. It is just a gentle layering that is needed. If you have made tahdeeg, serve it separately on another plate. Your finished rice will look an amazing colourful centrepiece on your table and will taste great served with chicken or fish. Now as I didn't have time to make this to take photos for this blog post, I'm afraid that you are going to have to put up with my rather poor illustration - but hopefully it will give you an idea. Remember to replace the nuts with peas and sweetcorn for young children. 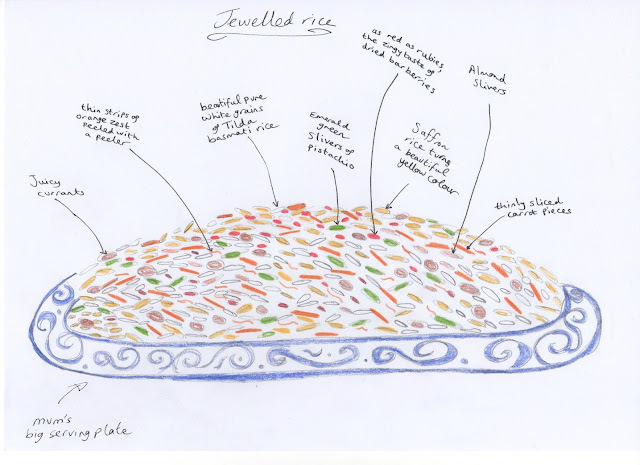 This post is part of the #FaveFamilyRecipes Competition with BritMums and Tilda Rice. Every pack sold will provide a meal to an expectant mum in need in support of the World Food Programme’s Mothers Helping Mothers initiative in Bangladesh. R2BC - Just feeling happy! 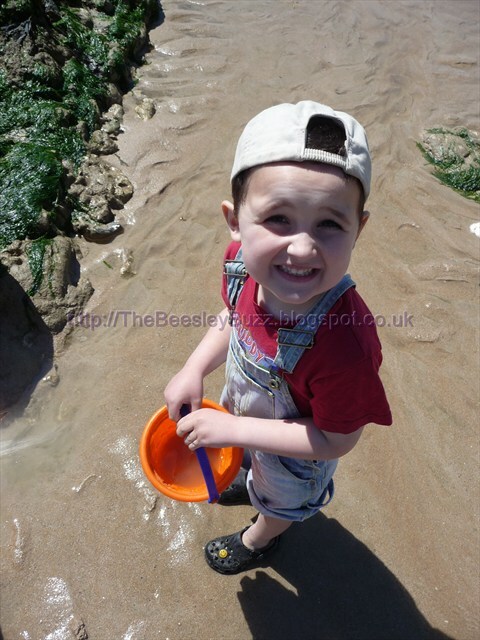 Last week I just didn't find a spare moment to join in with Mummy from the heart's weekly Reasons to be Cheerful blog hop. I popped by and read some of the other blog posts that had linked up (as I look forward to reading about everyone's week) but just didn't get around to it myself and I really missed it. So this week, I am making sure I take a few moments now to join in. I could try to pick out a few specific things like I normally do, but instead I'm going to tell you that since yesterday, I actually have felt really happy inside. I guess I hadn't really realised that I hadn't been feeling happy up to that point but for some reason (and I don't actually know why), I kind of felt like a burden had been lifted and just felt 'lighter' and happier. Perhaps it was the excitement of the snow that had been forecast? Perhaps it was because I knew Daddy had the day of work today to spent time with us? Perhaps it was because the kids had been calm all day and were really super at bedtime? 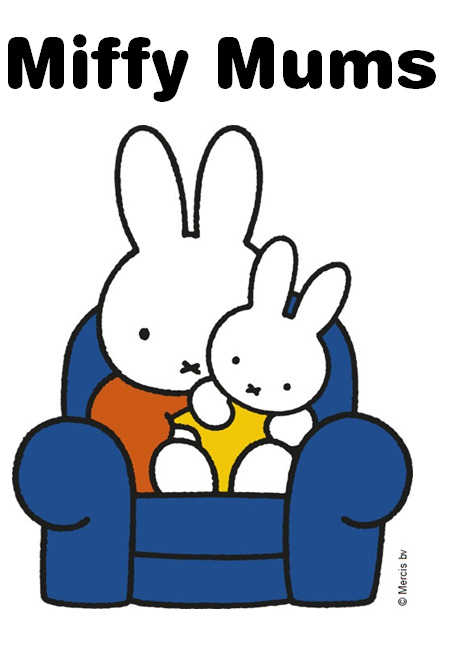 Perhaps it was because Daddy had to work late til midnight and although I normally feel really anxious knowing he is not going to be there to help with bedtime routines etc, I actually felt fine about it? I absolutely have no idea as to specifically why I suddenly felt different. It could even be hormones because with breastfeeding T, I still feel like my hormones are all over the place at times. Today, I have managed to successfully cook a Panettone, (not quite as successfully as the previous time when D was in charge and it turned out perfectly!) and also a lemon meringue pie (which I had never ever made before). The best thing about that was despite J and Daddy moaning that they didn't like lemon they both ate loads and had seconds too. Because I am actually a complete disaster area in the kitchen, having been able to cook those things has made me cheerful for today. So what are your reasons to be cheerful this week? A few days ago T turned 9 months old. I just wanted to quickly type up a few things she does so that I will be able to remember in future. One of the reasons for blogging was to capture these sorts of family memories but there just never seem to be enough hours in the day to do life and blog everything that I would like to too! Today T sat up in the bath on her own for the first time. Not for long though. She prefers to lie back and kick like mad to splash water everywhere. She has only recently started sitting up unaided although she has been doing a kind of belly-slide crawl technique for sometime now. She looks closer to 'proper' crawling as she is going onto all fours but then lifts her bum in the air and her knees up so not quite got the hang of it yet. We got some photos printed today and noticed how much more hair she has now than she did a few months ago. She also does this really lovely cute thing with her hands by holding her hand in the air and sort of twirling her wrist round. I don't remember the boys doing that at all when they were little. She likes to be held up to standing position and gets a big smile on her face to show how proud of herself she is. Weaning has been going really well. We have done a combination of baby led weaning and 'traditional' weaning and she is very confident with trying new foods and textures and she is not limited by the recommended 'age' brackets on baby food as she has learnt to chew so well. At the moment she has two bottom teeth. Oh and she loves singing! Even when she was just a few months old, if she started singing you knew she was tired and that has continued but more loudly now. She was even quite vocal yesterday when D was making one of his cheffing videos / blog posts (see the outtake video at the end). So now I don't have to feel quite so guilty for not keeping her baby record book up-to-date at all!!! Once again I wanted to join in with Actually Mummy's fab wot so funee? blog hop because it is just such a great way of preserving those memories of all the silly/funny/lovely things our little ones say. This week we have been reminiscing about a couple of things J used to say when he was somewhere between 1 and 2 years old (I think! as I can't remember exactly). We used to call him our SWEETY-pie a lot and it almost became a bit of a nickname for him. Then one day at dinner, we had a glass which had a picture of Warner Bros' Tweety-pie and Sylvester on it and we said "look there's tweety-pie". J just looked really sad and like he was about to cry and said "but I'm your tweety-pie!". He also used to go to baby swimming lessons which he loved (and he is still like a fish in water and loves going swimming!) and whenever he overheard me telling anyone that Wednesday was Swimming day, he would come running over and say "Splash! Splash! Women" (He was trying to say "swimming" but it always sounded like "women" and it made us laugh so much. As you might remember, last month we finally got around to setting up a 'Joshua's Jokes' tab on the blog where Joshua can add all his favourite jokes to, he started with his festive edition and all his favourite festive jokes. He actually made a huge list on paper which we had to stick together into a long scroll last summer when they held a talent show at the summer holiday club he attended. He came home very enthusiastically telling us about it one evening and spend several hours writing out his jokes to tell at the talent show. It was great to see him so keen and happy to do something that actually is usually so difficult for him (standing up in front of loads of kids and speaking). Now I have no idea how long it is going to take to type up his whole list - but I thought I'd make a start and this can be the January edition of Joshua's Jokes. Why did Tigger stick his head down the toilet? Because he was looking for pooh! Why did the Jellyfish enter the talent show? Because he thought it was a stinging contest! What do you call a singing contest for ghosts? How did the traffic light do in the contest? What kind of furniture is best at talent shows? What kind of music do mummies like? Because he had no-body to go with! How did the fire cracker do at the singing contest? Great - He burst into a popsong. The next bit of the list seems to be pirate and sea themed so I will stop there for today. I am thinking he has written enough jokes on his list to keep us going all year. Zulily, the daily deals store for mums, babies and kids has challenged bloggers to come up with their top 3 tips for photographing kids. The thing I love most about Zulily is that when I'm looking at their online store, it feels like Christmas everyday. That's because they get new deals in every day at truly fantastic prices, sometimes with up to 90% off. So each morning when the new deals go live at 6am, you'll find that you can't wait to get online and take a peek at what delights they have on offer for that day. Just like on Christmas morning when you can't wait to get downstairs to see what treats are waiting for you. Their clothes are truly adorable and I am always ooh-ing and ahh-ing over the cute dresses, lovely tops and oh-so-pretty little skirts that I know would look so fab on Trinity. But it doesn't stop there, they also have babywear, shoes, cloth nappies, toys, homewares, handbags, maternity wear and the list just goes on. These are all from some top brands at discounted prices. I regularly find myself doing a double-take because I just can't believe the fab discounts and I get so excited that I want to list you some of my favourite items on there right now, but knowing that the deals are updated so regularly there is little point as they may well change by the time you take a peek. So all I can do is to encourage you to pop over to their site right now (well in a few moments once you have read the rest of my post first of course!) and see for yourself. Now back to the topic of photography. Zulily run a fantastic monthly competition on Instagram where you send in a picture of your little one and you can win up to £100 to spend at Zulily They love seeing all the cute entries each month. So why not try out my top tips and then enter the Zulily's cuties competition yourself. I will add this caveat up front...I consider myself to be extremely bad at taking photos. Although I have always loved looking at photos, when it comes to taking them, I am usually a disaster area. But over the past few years I have perservered in my desperate attempt at getting a few decent photos of my children and I actually think that there are a few tricks that anyone can use to improve the photos you end up with. I love the photos where I have got down on my belly and seen things exactly how my baby would see them. You can then snap away and get a great angle from the same height that they are at without always 'looking down' on them. I managed to get some lovely Christmas ones like this. You are far more likely to capture those natural moments and smiles as they giggle away at how silly you look wriggling around on the floor. You can also get some stunning ones without a smile in sight because sometimes you can capture a certain beauty, naturalness and vulnerability without having to pose with a smile. So many times I have somehow managed to snap the perfect pic of my child and then find that in the background there is an overflowing bin/a pair of pants/messy pile of junk* (*delete as appropriate). I find I get really annoyed at myself when this happens because even if I try cropping the photo, it is not always possible to remove the 'offending item' from the background. So I try to keep an area of the house clear of clutter for when I really want to get a few nice photos (you can always brighten a white background on the computer afterwards if you need to). Alternatively head outdoors. The greenery and scenery in a natural outdoor setting like woodlands, parks, fields or the beach provides a great backdrop to photos and you'll also benefit from the natural outdoor light which can make your photos look so much better. 3. Be patient when trying to get the perfect picture but do all you can to improve the odds! Sometimes you can get lucky - just pull out the camera at the right moment and get a lovely picture without effort. A spontaneous shot that turned out really well. But more often than not, when you are trying to get a good picture of a child you are going to need oodles of patience, but you can try to improve your chances by making sure they are not tired or hungry when you get the camera out. Learning a few of the basic settings on your camera an prove to be a huge ally in your quest to get great pictures of the kids. For example, we set the camera to high speed burst mode to increase our chance of getting all three children looking at the camera when they were having this teddy bear's picnic in the garden. Within a few minutes we got the shot we wanted but the camera had taken hundreds of snaps in that time and only one of them had them all looking the right way at the right time. If we hadn't used the high speed burst mode I am pretty sure that we would not have had speedy enough reflexes to capture that particular second on film (well on SD card I should say in this digital age). Using high-speed burst mode enabled us to get one fantastic picture. Similarly, we would not have been able to capture the exact 'splash' moment if we hadn't used this feature on the camera for this photo. Or how many times have you missed that magic 'twinkle in the eye' moment of a smile? I guess with practice you can get better and quicker at clicking the button at that precise moment, or you could increase your chances of capturing it with a little help from your camera. A word of warning though - you will need good lighting for this (preferably outdoors) as the flash doesn't work at the same time as using this setting (well it doesn't on our camera anyway). I hope you have fun trying these tips out. Would love to hear if any of them work well for you. And don't forget to enter those piccies of your cuties into the monthly Zulily cuties competition too! This is my entry into the Zulily 'Top Tips for Photographing Kids' blogger competition. If you would like you find out more or if you are a blogger and would like to enter, click here. You may remember that over the past couple of months Tots100 and Center Parcs have been setting bloggers a series of family challenges. You may well remember our Dragon Defeater waterslide from November and our Perfect Elf Poem in December. Well for January Tots100 and Center Parcs have challenged us to create a mini home spa experience and I think the word challenge is certainly the right word to describe it as I know that it is a real challenge for me to find any me-time because homeschooling the boys and having a baby just seems to take up every moment of the day. But I was determined to have a go, so using some of the fabulous tips given by Center Parcs Aqua Sana Spa Manager, Amy Neale, combined with some of my own pampering secrets, here's how I got on. Here are my top tips for getting off to a good start with your mini home spa experience. Firstly, put someone else in charge of the kids for a couple of hours. Next turn off your PC / phone / any other electronic device that you rely on for checking facebook, twitter, emails etc. Now I realise that this may prove to be exceptionally difficult for bloggers to do but trust me, the world will not come to an end because you didn't favourite that tweet straight away or update your facebook status for a couple of hours. Now what I'm about to say may not fit in with your idea of pampering, but bear with me. Try to have a quick tidy up or de-clutter of your bedroom or bathroom (or whichever room you have chosen to relax in). You will thank me for this tip when you are relaxing in the bath without being distracted by how grubby the sink looks, how much toothpaste the kids have dripped all over the floor and so on. It may seem like a pain at the time, but I always find I feel a lot better for having a tidy and clean house (or at least one tidy and clean room in the house). I started my mini home spa experience by making Amy Neale's fantastic face mask 'recipe' using yogurt and honey. Once you have covered your face in the face mask, you can relax in the bath for 20 minutes to really enhance your pampering experience. I also make my own exfoliating scrub which is great for dry skin on legs and arms this time of year. This is really simple to make using honey (the last bits remaining in the honey jar that often go all hard and set are great for this), sugar and lemon juice. Then just rub into your arms and legs and rinse off. You really will be amazed at how soft your skin will feel afterwards. Don't forget to apply plenty of moisturiser afterwards, not just to your face but also to your elbows, knees and feet. You will almost hear your skin thanking you for it at this time of year when the cold weather seems to really take its toll on our skin. I'm not a big fan of lots of make-up or cosmetics but I do think that a quick lick of paint on your toes can really help you feel pampered and it will help brighten up those dull January days. Every time you take a peek at your toes looking pretty and neat, it will remind you of your post-Christmas home pampering session. Amy suggests livening up your drinking water with mango, strawberry or mint. Well my favourite is simply a slice of lemon. It simply transforms drinking water from being a chore to making you feel like you have had a drink made for you. If you feel like you are fighting off a winter cold, lemons can come to the rescue with that too. Just add a squeeze of lemon, a little finely grated fresh ginger (I keep a piece in the freezer and it makes it easier to grate too) and a dollop of honey. I keep some in the bathroom instead of artificial (and often expensive) air fresheners. We make little fabric lavender bags and pop them in drawers and cupboards to keep the moths away. The kids love making lavender soap with it. You can buy a block of soap base from craft shops and then simply melt in the microwave, then add in your dried lavender, plus a few drops of lavender oil, then pour into little moulds (we use empty yogurt pots and fill them to around one-third full), then leave to set. You can even add other goodies to it like poppy seeds to make it into a bar of exfoliating soap. So by using your home-made lavender soap through the week, you will be transported back to your moment of relaxation. A lavender pillow spray at night will also help you feel calm and relaxed too. You can even use lavender in cooking too although we haven't tried that ourselves yet. So there you have it our very own mini home spa experience. If you fancy having a go there are some great tips over on the tots100 Center Parcs January challenge page and if you are a blogger, you can join in by writing about your mini home spa too for a chance to join the Center Parcs family blogger club. When Nuby sent us these Snug n Dry feeding bibs to try I just knew straight away by seeing them and feeling them that they would be perfect for catching those milky dribbles and baby posset. They really are soft and absorbent and fit snuggly around the neck. So often I find that bibs are loose around the neckline meaning that T ends up with sticky milk all around her neck and dribbling down into her vest. I have used bibs on my babies right from the start because mine have always been quite possetty and I quickly figured out that it is easier (and quicker) to change a bib rather than change a whole outfit each time they bring up some milk. So these bibs are perfect for the morning and evening breastfeed that T still has each day. I have also found that by putting them on under the rubbery 'catch all' style bib that she wears for mealtimes, it helps prevent her runny breakfasts or brightly coloured baby purees from staining her clothes. Her 'catcher' bib isn't a close fit to her neck and leaves a gaping gap for food to go down through - hence this Snug n dry bib provides the perfect solution. I personally also love the colour and design of these bibs with the pretty pink edging and the pink butterfly embroidery - they would look lovely on a newborn baby and are suitable from birth so would make an excellent choice of newborn gift being pretty and practical for new parents. *Price correct at current time but please be sure to check the price at time of purchase as prices may change. Lambing - newborn lamb, a few minutes old. One of the main negatives that people comment about when they find out that we home-educate the children is the 'lack of socialising' and how they are 'missing out' by not being able to see other children. I know this is actually utter nonsense because I have never come across a more social group of people than the home-ed community - although we don't join in with many things in the wider home-ed group, I am on the mailing list so I get to see just how much social stuff they do. There are so many hall meets, library visits, museums, galleries, theatres, other outings, gymnastics, football, craft, pottery, nature walks, music activities, bowling, swimming, ice skating, parks, and just so so much more that goes on pretty much all the time. And whilst schools generally like to arrange children by age group / year group, home-educated children get to mix which other children and adults of all ages which actually is much closer to 'real life' than the way schools do it. After all once you are in the work place you are most likely not going to be sat on a desk next to colleagues who were born in the same year as you! 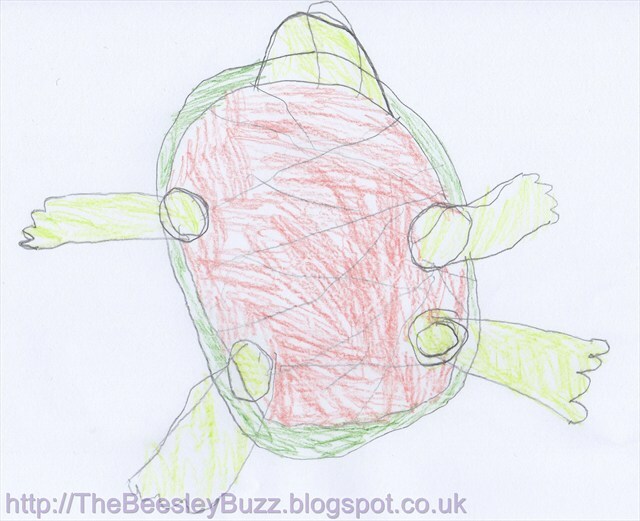 Despite knowing this in my head, every once in a while, I would still have a little wobble and wonder whether the children would be getting more social input in school and today I realised that in just one day, J probably had more meaningful social contact with others than he would have had in a whole term at school. One of the lovely local home-ed groups set-up specifically for families with Autistic children had organised a visit to a local college where the lambing season had started. As well as seeing the newborn lambs, there was also a craft activity and time to socialise over our packed lunches. I was so proud of J for holding it together the whole morning and it was so great to see him chatting away with some of the other children. I'm pretty certain that in a school environment he would have immediately gone into 'fight or flight mode' and he would be so overwhelmed with the noise, sensory overload and social pressures of school that he would not have been in a state to be so calmly chatting away and looking so relaxed and happy. So next time I have the 'social interaction' wobble, I will remind myself that surely it is better for J to get limited amounts of meaningful social contact with others so that he is able to cope with it and enjoy it rather than be immersed into a 9-3 Monday-Friday school environment where he would end up most probably being separated from the other children and being kept indoors at playtimes (as used to happen when he was at school) resulting in even less actual social learning taking place. Wot so funee - A logical conclusion? Daniel has enjoyed me reading a bedtime story with him lately (which for a while sadly we got out of the habit of doing as he became better at reading by himself whilst mummy breastfed Trinity). He also likes brushing my hair as he says that if he decides not to be a chef, then he'll be a hairdresser. So after we read Anne Fine's 'Return of the Killer Cat' (which we had to buy a copy of as somehow out of the zillions of books we always borrow from the library - the kids have managed to lose this one for months and I don't think we'll be able to renew again so have had to buy a replacement), Daniel gets my hairbrush and starts to brush my hair. 'Ouch' I yelp as he tries to brush out a tangle. 'Be careful with my scalp'. Daniel: 'Well you drink water through your mouth, which is part of your head, so that's why the hair on your head grows longer because it gets more water'. I can see his logic - he must be trying to make sense of it in the same way that plants need water to grow - but it was hilarious. He was also very cute in calling a pickled onion a 'freckled' onion! Having reached the end of the first day 'back to homeschool' after the Christmas holidays, I am feeling surprisingly relaxed. It occured to me that for some reason Mondays are usually our best day in terms of homeschooling. Perhaps it is the break after the weekend (or in this case, the Christmas break), perhaps it is the start of a fresh week, I'm not really completely sure of the reason why but most Mondays seem to go well. The boys tend to stay focused and get all their planned school work done and I don't feel stressed (probably because they stay focused and get their work done). In contrast, Tuesdays often seem to be the most difficult day of the week. One of my friends pointed out that it could be that expectations for a Tuesday are higher both in the workplace and in terms of school / homeschool - having eased back into the week on a Monday, perhaps we expect to be going full steam ahead by Tuesday? One of the things I am most pleased about today, is another homeschooling friend whose child has similar problems to Josh in terms of sensory issues and ASD recognising that if they had been going back to school today, then life would have been SO much more stressful. Thinking back to a couple of years ago when this would have been the first day back at school - I can recall all those horrible feelings. Knowing there would be difficult days ahead and not being able to do anything to help. Seeing Josh really stressed in the run up to returning to school. Going through all the social stories of trying to help him understand playground politics and yet knowing that he would still be left out or sent indoors for not knowing how to play nicely with other kids. Being called over by the teacher at the end of the school day to have all of the negatives about Joshua's behaviour listed to me - in front of Joshua! - I had honestly thought that teachers would have been the first to know about the basics of behaviour management and if they were going to be telling me things like that in front of Josh, it should have been finding a positive and mentioning it so that he learns that a bigger fuss is made of the positive stuff rather than the negatives. Even if Tuesday does turn out to be difficult, I am going to remain glad that at least it is not going to be as difficult as that. This book is funny. Mr Grunt likes kicking things and when he kicks a pylon lots of bees come to attack him. Mr Grunt stole a baby hanging on a washing line. They called him Sunny. They travel around in a caravan. Joshua is a HUGE fan of Philip Ardagh and he loves the Grubtown tales series of books too. This book certainly didn't dissapoint with the silly and sometimes strange sense of humour that Josh loves so much (I mean a boy in a blue dress - can't get much crazier than that!). Mr and Mrs Grunt are just what you would expect them to be and seem to enjoy arguing with each other most of the time. The plot has several unusual twists and turns involving bees, an elephant, a circus clown and fireworks which all fall into place by the end of the story. Illustrated by Axel Scheffler, this book is a must for both Ardagh and Scheffler fans. The kids also enjoyed the free iTunes app that you can download where you drag bees onto Mr Grunt's 'beard of bees'. We are already looking forward to reading more books in this series. Christmas is not my favourite time of the year. There I said it. Not everyone in the family would agree but for me I would rather just get away from it all and escape Christmas. But that is not going to happen. So the next best thing... A great family day out. Did you know if you are looking for Days out vouchers, or discounts for family days out, then Moneysupermarket.com have thousands of vouchers and discounts for a great day out with your family. After all the spending that goes hand in hand with the chore joy that is Christmas, having a great day out at a great price is a welcome bonus in my book. So could our visit to Bluereef Aquarium in Hastings have been Britain's best day out? Here's our video so you can judge for yourself. Unlike many attractions, Bluereef Aquarium is open ALL year round - EVERY single day of the year (except for Christmas day). That is pretty impressive and great to know if you need somewhere to escape to and have fun on a cold wet windy day in winter as we did. A cold, wet, windy day in December! It is located in the Old Town part of Hastings with the quaint fishing huts and the backdrop of the hastings caves and cliffs and the funicular railway (the steepest in the UK!) literally a stones throw away. Situated right next to the beach with plenty of parking in local carparks, you even get a sea view from the cafe inside Bluereef aquarium. If we had been blessed with better weather, then I am sure that the kids would have insisted on making a really big day of it seeing the local sites in the Old Town, but as it was there was amazingly a lot to see and do in an aquarium that was not that big in itself. Even though we visited on a Saturday, the aquarium itself was not overly busy which made it perfect for getting to see everything and getting involved in some hands-on stuff like stroking a snake, seeing the fish being fed and being able to ask questions. With the two older children being homeschooled it was great to see them learning so much in such a fun way! (That's ALWAYS the best way to learn). We loved the conservation aspect that was also evident at Bluereef aquarium, but done in such a way that it was not 'in your face' in any way but just perfectly complemented and supplemented what we were experiencing when seeing some of these amazing creatures like the sharks, rays, jellyfish, seahorses and many many more. 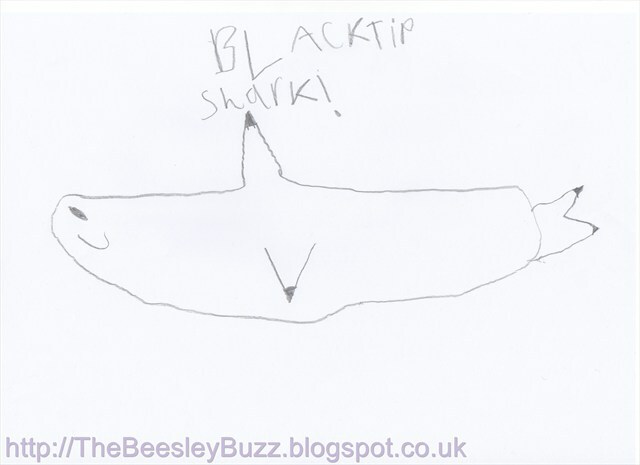 The real test of a great day out is how much it inspires the children and when we found that the kids had woken up early the next morning, rushed downstairs and drawn these all of their own accord, we knew for sure that they had enjoyed their day out and certainly had been inspired. The verdict. Could we be the one's who have found it? Was this really Britain's Best Day out? You've seen the video (my favourite part is baby Trinity making friends with that cute dog-faced pufferfish towards the end of the video), you've read the review, you've seen the impact it has had on the kids. You can judge for yourself how much you would enjoy a day out at Bluereef Aquarium. We'd certainly recommend it. Remember to check for Money-off vouchers and discounts at Moneysupermarket.com if you do decide to go. But does it really have to be Britain's best day out to be our best day out? Life is busy, there's no doubt about that. Whether it is around Christmas time or not, there is always something vying for our attention and trying to steal our precious time from us. Perhaps more importantly, trying to steal time away from our children. So if any of us are going to make a new year's resolution it should be to spend more quality time with our children and to cherish special days out like these so much. Our kids are not kids for long...one day those little hands that are so keen to hold yours, those little voices begging for another bedtime story, those little feet that love to jump in muddy puddles, will be gone and replaced by someone that is too grown-up to want to do those things (at least until they have children of their own). But the memories will last. They will remember the day that was too wet and windy to do anything else that they spent a special day visiting a magical underwater world. A world where they came face to face with a shark, were waved to by a sting ray, looked into the irridescent blue eyes of a puffer-fish, and discovered the tiniest jellyfish. With thanks to Tots100 and Moneysupermarket.com's Britain's Best Days out challenge for providing a free family ticket for the purposes of this review. R2BC or R2-D2 as my son wants to call it! Whilst everyone else has a bout of the January blues, over dinner, Joshua exclaims "it is such a good time of the year because lots of good things have happened around now" and he proceeded to list them. I said that he could do the R2BC post this week as he had lots of reasons to be cheerful, to which he replied "R2-D2 ok then". 1) It was daddy's birthday yesterday. 2) Daddy got a LEGO Star Wars game for his birthday. 3) It was Christmas recently. 4) 'Dumping Ground' started today on CBBC (the new series of Tracey Beaker but without Tracey Beaker in it). 5) On 11th January, series 5 moshlings released! Oh to be an 8 year old again. Mummy is just going to sneak an extra one in here...I found out today that a good friend of mine has had her first ever competition win and she has been trying so hard to win something for the past 6 months or so. And it is an amazing win for a first win - an ipad! She is always helping others and is just such a lovely friend that I just feel so happy for her. Its all in my cloak! You may remember that in December, Direct2mum put us in touch with Jokers' Masquerade to review one of their fancy dress outfits and you can read all about our wild west evening here. Although we received the wild west dress without any charge for the purposes of reviewing it, we were so impressed by the range of fancy dress products that they stocked, the reasonable prices and the excellent service, that we actually went onto buy another outfit from them. So this post is not one that we have been asked to do or required to do but we actually wanted to share with you just how great this Wizard Boy costume was for Daniel when he played the role of an evil wizard in his drama show last month. The outfit consisted of a cloak (of impressive quality! ), a felt hat (the quality of this was less good but it did the job), and a thin polyester top designed to look like a harry potter style school jumper/shirt/tie combination. The whole outfit cost £11.49 (18% off the RRP of £13.99) and was a Smiffy's branded product. Daniel had the medium sized outfit which is designed for 7-9 year olds and as a big 6 year old this was perfect for him. A magician's wand is also available for £1.99. However, Daniel didn't need one as it would get in the way for the singing, dancing and actions that he needed to do for his show. Despite my severe lack of creative skills when it comes to any kind of sewing project, I could most probably have cobbled together some sort of cloak for him myself and made a wizards hat out of cardboard. However, during the busy month of December, it was just such a relief to not have to worry about coming up with a costume myself and I think it just gave Daniel that extra little boost to his confidence to be wearing such a great wizards outfit. I know every parent is proud of their child, but I was actually extremely impressed with my little boy. He had only ever participated in one nativity show over two years ago (and he didn't even have any lines to say then), and here he was with one of the main parts of the show remembering his many lines, saying them loudly and clearly, singing a song solo and acting his heart out. I couldn't quite believe my eyes - he was one amazing kid! It's all in my cloak! A Grand Adventure to Peru...Perhaps a possibility? Will we ever get to see one of these for real in Peru? We are not travel bloggers, so why on earth am I about to tell you about our dream epic adventure to Peru. Well there are points in life that you sense are 'now or never' moments and with our sponsored child Amni nearing the end of her school years within the next few years, we have realised that if our dream of ever meeting her is to come true we are going to have to start planning now. Since we started to homeschool the kids a couple of years ago, one of the things I have enjoyed the most is the freedom that comes with it. Not having to go begging to the headteacher for a day off school, or worse still to go on holiday! Having the freedom to go with our moods in terms of what we learn and what we do. The freedom to make the most of the weather - building sandcastles on the beach in the sunshine and puddle jumping in the rain. Deciding to go for a day out at the last minute and not having to be accountable to anyone. It is just a different kind of lifestyle to the usual 9-5 (or rather 9-3) that other families are tied to. So what if we could go one step further. What if we were able to go on an extended holiday to combine the dream of meeting Amni, along with the amazing epic adventure we would have seeing the most incredible sights of South America, with the lifestyle that we have found so liberating. Moneysupermarket.com along with Aswetravel.com have challenged us in their 'A Grand Adventure' competition to describe the epic adventure we would have, where we would go and what we would do and how we could get our budget to last as long as possible. Granted, travelling with kids on such an adventure is probably not ideal, and I imagine that most of the other bloggers participating in this challenge are most probably more experienced travel bloggers and are travelling without kids in tow. But we are certainly up for a challenge and if we couldn't go with the kids, then I wouldn't want to go at all because this adventure would be as much about opening their eyes to the world as it is about us experiencing it. This point is particularly important to us because this dream, this adventure, all started with a child. That young child staring out of that photograph at us 10 years ago. Those sad eyes awaiting a sponsor. Over the years that photo has been updated with a bright happy smiling face and news of how much she loves learning and telling us about her family, her friends, her teachers, the Peruvian festivals, the Peruvian food, and how she hopes that one day she will meet us. And now I can see all these threads coming together. The link with Peru, the homeschooling, the children, the freedom, the lifestyle, the dream. There is another thread to add - the regret. As a teenager, when many of my friends were heading off on around the world adventures, I thought there would be time to do that after Uni. What was the hurry? What difference would a few years make? I would just do my uni course first and then have a break to go travelling, right? Wrong! I had no idea just how quickly people can become 'trapped' in the cycle of needing to get a job, having the responsibility of a home, and then a family, and then the limitations imposed when the kids start school and all of a sudden a huge pin is put in your dream and it bursts. Yes I regret that decision. An opportunity to travel missed becomes a regret. I realised that all the more so when pre-kids we visited relatives in Canada and the USA for a short holiday. How amazing it was to see scenery so different, how fascinating it was to see differences in cultures that you had previously assumed were pretty similar to your own. How unreal it was to experience such different climates within such close proximity like snow capped mountains only a short drive away from sunny beaches. At the time, it was a big expense for such a relatively short holiday and yet I have no regrets at all about it. The experience was so worth it. So now I don't want to live with another regret. I want to find a way of experiencing Peru on a budget, rather than live with the regret of never experiencing it. So not being an experienced traveller but instead relying on learning from the lessons of others along with a bit of common sense (I hope) thrown in, here's our dream adventure of a lifetime. Whilst the driving factor in picking Peru as our dream destination was to see Amni, I challenge anyone to not be mesmerised by the fascinating history of Peru in terms of its ancient cultures and civilisations especially the Incas. Combine that with the stunning scenery of the Andes which runs pretty much along the full length of Peru, add in the wildlife aspect (over 80% of the world's different eco-systems are represented in Peru) and you have an irresistable recipe for an epic adventure. Of course Machu Picchu has to be top of the list to visit (and will probably top of the list for every tourist in Peru) and the budget would take a big hit with this - so extra savings will need to be made elsewhere as there is no way I would visit Peru and not visit this magical place - the lost city of the Incas which was only rediscovered in 1911. Whilst this is going to be an expensive part of any trip to Peru, by buying any souvenirs from local markets away from the main tourist sites, you will not be paying tourist prices and can be making sure your money is going into the local economy. Whilst visiting the Sacred Valley of the Incas where those snow-capped mountains overlook the bubbling Urubamba river, there are some other amazing Inca ruins to be found at Ollantaytambo. If you are travelling without a family in tow and want a really amazing experience in Peru, I spotted an advert in the latest edition of The Big Issue magazine for a charity that trains volunteers to go out to Peru and help at a centre for children with special needs. Sadly in Peru, many communities still hold the belief that children with special needs are born with a curse and education and support is needed to break this cycle. For a minimum donation (which is far less than it would cost otherwise) you can volunteer with this project, receive accomodation at the centre and trips to Machu Picchu and tours of Lima and Cusco are also included. It sounds like an amazing and very worthwhile experience to be involved in whilst helping you live in and see Peru on a budget. Lake Titicaca is the highest navigable lake in the world and the largest lake in South America. Legend has it that it is the birthplace of the Incas - the sun sent the first inca king to the lake to found the Inca Kingdom. It is home to the Uros people who amazingly live on reed islands they have woven! Many people in this area still live by subsistence farming - that would be a real eye-opener to my kids and us. Another eye-opener I discovered is the Peru has some of the best sand dunes in the world for Sand-boarding. I don't fancy my own chances at being able to do that, but I can think of one or two people I know who would be so up for it. Having witnessed my brother travel around the world living in hostels, and having had a few UK breaks away in Youth Hostels, we have been really impressed with the standard of accomodation available and the availabilty of family rooms, yet at budget prices. Having had a quick peek at the website for Hostels in Peru, I have found that Peru has 30 hostels and some look just so idyllic that I would opt for them instead of a posh hotel anyday. Just take a peek at this one in Cusco...it just reflects the colour and vibrancy of Peru so well and is just picturesque. And so is this one which is located right in the heart of the Sacred Valley of the Incas. Homestays are also a low cost, no frills option in Peru where you can stay in the homes of villagers. One of the places that offers homestays are the villages on the islands on Lake Titicaca which is one of the places I dream of visiting. Homestays are also available in Cusco too. One of the things I used to laugh about whenever my little bro used to phone home from his travels was that he had learnt to cook whilst travelling. He had found that a really cheap way to eat whilst staying in hostels was to use the items that others had left behind when they had moved onto their next destination on the communal / 'help yourself' shelf of the fridge or larder. I remember him telling me how he would do "Ready, Steady, Cook" everyday to see what he could cook for free every day using those free items. I have to admit that it is a genius idea. Although I think I would make sure I had a few of my own ingredients in stock just in case, the principle is a great one as I never think food should go to waste. When eating out, it is logical I suppose, but look for where the locals like to eat as that usually signals good food at reasonable prices. We did come a little bit unstuck when we did this in Vancouver when we ended up in a Chinese restaurant that was so favoured by the local Chinese community that the menu was only in Chinese and the restauranteur could only speak Chinese. We somehow coped though and ended up eating a very tasty meal. Reading up on travel blogs apparently the bargain meal of the day has to be going for the set menu at lunchtime where you will get a pretty huge meal by the sounds of it from anywhere between 3 and 7 soles. So if you have lunch as your main meal of the day when you are more likely to be out and about anyway, then that should cut your food costs down considerably. Apparently Cusco is fairly walkable and there are free walking tours which would of course be the budget option rather than the tours organised by the travel companies. For longer journeys, economy bus travel seems to be the most budget option. Whilst mentioning free activities the Chocolate Museum is free whereas many of the other museums have an admission fee. Being a lover of Chocolate, I guess that is going to be a must on my list of things to do. Doing a bit of research beforehand should really help save those pennies when travelling. There are so many websites and travel bloggers out there and if they are anything like the parent-blogger community, then I'd imagine that they'd be very friendly and welcoming of any questions. Aswetravel.com is where experienced travellers Nathan and Sofia share their experiences. 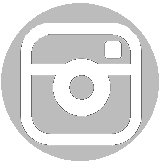 Travelling around the world since 1998 they blog and make videos about the locations they have visited so you can get a heads up before you head off on your travels. Their website just oozes the passion that they have for travel and I would challenge anyone to be able to take a look and not be inspired to want to go and visit somewhere and see something more of what the world has to offer. I hope that in my own little way, I have inspired you to want to see something out there that you have not yet discovered, somewhere where you have never visited before. I know that as I have found out more and more about Peru I am longing more than ever to be able to visit.